We have received numerous requests for information on the NPEO Web Camera #2 images showing the development of a significant melt pond around the camera. 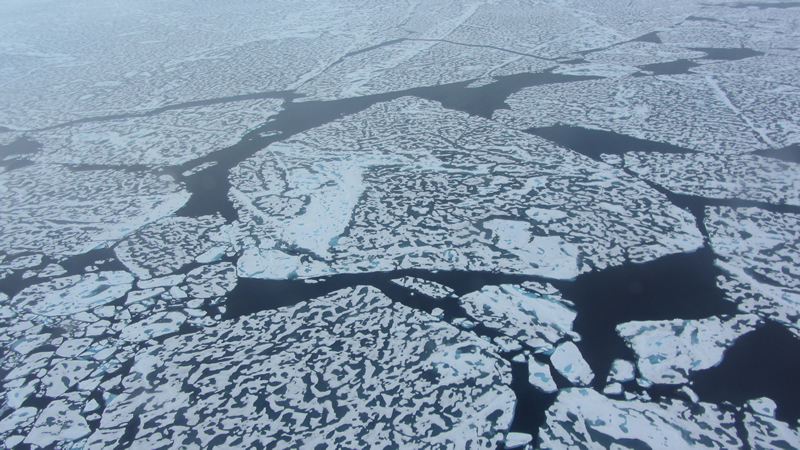 The formation of melt ponds has always been a key feature of the summer season on sea ice. Each summer, solar radiation melts the snow cover and 10-50 cm of the sea ice upper surface. Depending on the porosity of the sea ice, the number of cracks, and distribution of openings at the edge of individual ice floes, some of the melt water from the surface drains to the ocean and the rest forms melt ponds. These are fresh water ponds lying on top of the sea ice with their surfaces slightly above sea level. 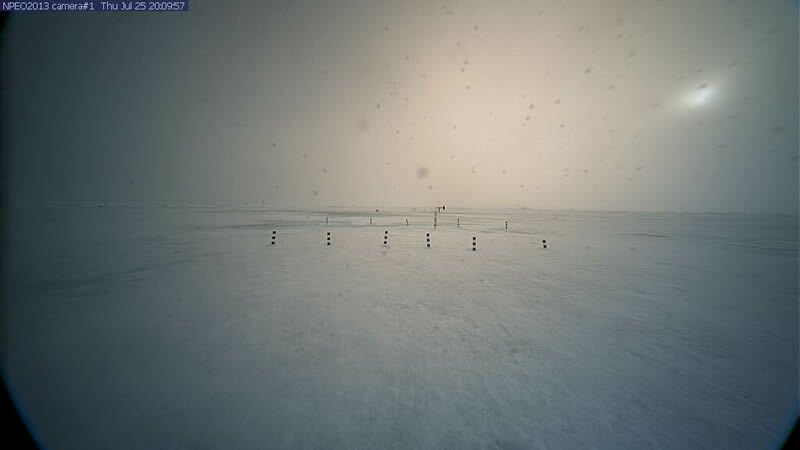 Web Camera #1 is a system built and deployed by the Polar Science Center in April 2013 at the Barneo ice camp approximately 25 miles from the North Pole as part of the NSF-funded North Pole Environmental Observatory (NPEO). It is meant to give a visual record of ice changes over the spring-summer-fall season. Ablation stakes made of plywood strips 10-cm wide and marked with alternating black and white 10-cm squares are planted in the ice near the buoy to indicate visually the amount of surface melting as the summer proceeds. Also in the field of view of this camera are an Ice-T buoy built by Frederic Vivier of Le Laboratoire Ocean Université Pierre et Marie Curie (UPMC) to measure bottom melt and heat conduction through the ice and a Polar Ocean Profiling System (POPS) installed by Takashi Kikuchi of JAMSTEC to measure temperature and salinity profiles in the top 1000 m of the ocean. The camera is about 1.5 m above the April ice surface. The Ice-T buoy is 12-14 m away from the camera and the POPs buoy is about 53 m away. Web Camera #2 was built by the Polar Science Center with the support of Jean-Claude Gascard of UPMC. It was installed and its data are recovered by NPEO in a joint effort with UPMC. It was installed in part to monitor the fate of the large Acoustic Ice Tethered Profiler (AITP) ocean buoy its AITPs laser cloud sensor. For this reason it was placed close to (~ 3 meters) the AITP. It is also surrounded with 10-cm wide ablation stakes. The camera stands about 1.8 m above the April level of the ice surface. Owing to the wide-angle lenses used in the cameras, the AITP and the stakes are closer to the camera than they appear. The two web cameras are about 200 to 300-m apart with Web Camera #2 looking to the right side of Web Camera #1 and Web Camera #1 looking away from Web Camera #2. In the July 26, 2013 Web Camera #2 images it is difficult to appreciate the size of the melt pond, but judging by the position of the small ridge beyond the far edge of the melt pond, we estimate the far shore of the pond is 20 to 50-m from Web Camera #2. It is about 40 cm deep at the AITP buoy. The AITP buoy, and subsequently Web Camera #2 were placed in a relatively low spot in the ice with a greater than average snow thickness, both of which contribute to the formation of the melt pond. Web Camera #1 and the surrounding buoys were placed on ice that was relatively thicker and had a slightly higher upper surface to avoid having them in melt ponds during the summer. This probably results in the Web Camera #1 giving a better representation of the general melt pond coverage of 20% to 50%. When the top surface of a melt pond reaches above the freeboard of the ice floe floating in sea water, melting from both above and below will often penetrate the bottom of the pond at the thinnest point, causing the pond above the ocean line to drain, often quite abruptly. Web Camera #2's melt pond drained pretty rapidly around 1900 GMT on Saturday July 27. This is illustrated by the images from July 27 at 1300 GMT when the melt pond was full, July 27 at 1900 when it was down about 10 cm, and July 28 when the melt pond is completely drained. Comparison of the before and after images shows the pond was 70 cm deep at Jean Claude Gascard's UPMC (University of Pierre and Marie Curie) buoy. 1) Is that the ocean melting through the ice or is it really a lake? It is a small shallow lake resting on top of the ice. The water is almost completely fresh because it comes from melted snow and sea ice. 2) Why do the images from Web Cameras #1 and #2 look so different? Are they in different locations? 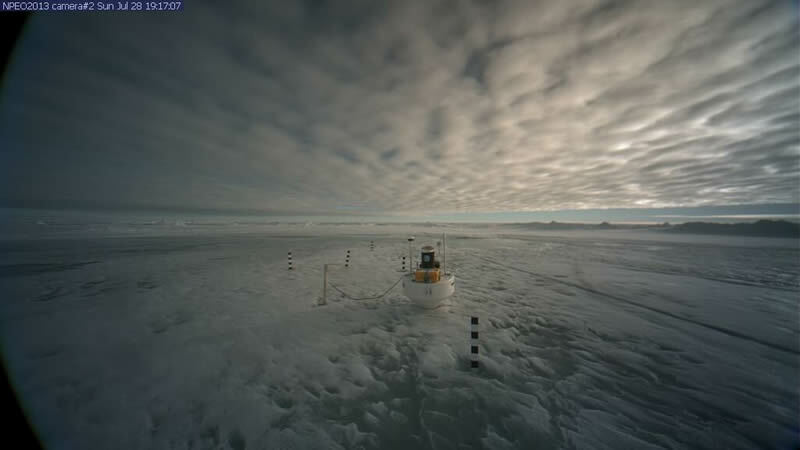 The two cameras are on the same major ice floe, but the wide-angle lenses of the cameras make things look much more distant than they actually are. Thus the highly variable character of the surface is not clear, especially for Web Camera 2, which is only giving images from inside the melt pond. 3) Are you alarmed at the appearance of the water near the North Pole? 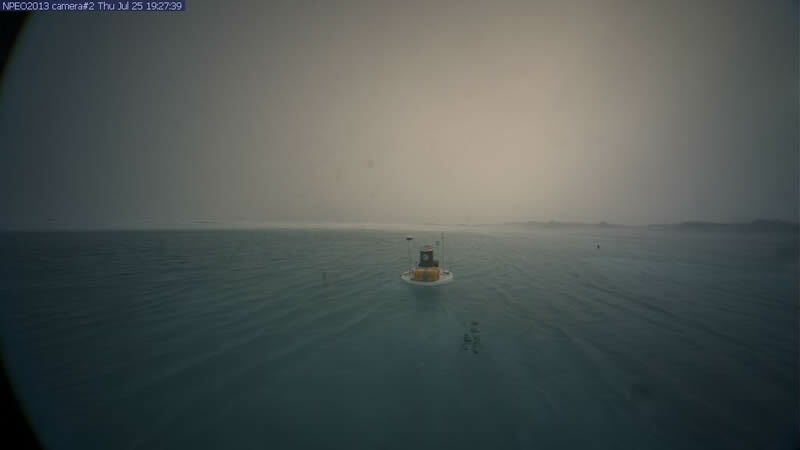 No, melt ponds form every year, and considering Web Camera 1, the melt pond coverage at this location (the cameras and buoys have drifted to about 85°N, 5°W) looks pretty typical for this time of year and this location. Actually, we are more concerned about the extensive melt pond coverage that we have found on the Alaskan side of the Arctic Ocean as part of our Office of Naval Research-funded Seasonal Ice Zone Reconnaissance Surveys on U.S. Coast Guard Arctic Domain Awareness flights. 4) Is the appearance of the pond due to global warming? No, not specifically. These melt ponds are a normal part of the seasonal cycle of the sea ice. With respect to global warming, we are more concerned when we see warm air temperatures in the winter that inhibit ice growth and the appearance of heat in the ocean that would melt the bottom surface of the ice.